When you think "happy hour," you're probably reminded of sports bars offering 25-cent chicken wings or half-price pitchers of cheap domestic beer. And sure, sometimes that's exactly the kind of thing you want after a long day, but occasionally, you're in the mood for something a bit more refined than a gargantuan plate of nachos. But until recently, a lot of upscale restaurants didn't offer happy hour options. And in a way, it makes sense; after all, most fine dining establishments don't have a lot of overlap between their lunch and dinner offerings, which means the kitchen and a lot of the ingredients have to be switched over at the time when most happy hours take place. Fortunately for us, that's starting to change. We're seeing more and more high-end restaurants offer happy hour menus that allow the after-work crowd to stop in and enjoy a more sophisticated bite to eat. As with a lot of culinary trends, Miami is one of the early adopters of what we call "haute happy hours"- happy hours that are offered by more upscale establishments. Today, we're going to take a look at the happy hour menus of four restaurants in Miami that you'll definitely want to visit in 2017. First on our list is Bachour Bakery + Bistro. Described as "an urban oasis," Bachour offers a unique menu that encompasses a variety of culinary styles. The traditional menu offerings include gazpacho, braised oxtail sandwiches, and a full complement of bakery items courtesy of Antonio Bachour, the restaurant's namesake. The happy hour at Bachour B + B runs from Monday-Friday from 4-7 PM, and you can order from their happy hour tapas menu (which includes roasted brussels sprouts with cashew, clover honey and apple cider; Israeli couscous with pork belly and 75-minute egg; and the daily fish with house BBQ sauce, creamed corn, mushy peas and charred leeks) or from their bakery. And to wash it down, they offer $4 beer and $6 wine, mimosas, and bellinis. A perfectly refreshing option after a long day in the Miami heat. Next up is Izzy's Fish and Oyster. Owned and operated by Jamie DeRosa (whom you might recognize as a Top 100 Social Chef on our Chef's Alliance list), Izzy's menu focuses primarily on seafood and oyster dishes. Of course, with an accomplished chef like Jamie at the helm, the menu includes much more than just seafood offerings. Izzy's happy hour runs from 4-7 PM every day. Offerings include 1/2-off chef's selection oysters, $3 Florida Stone Crab claws; the "Salty Dog Basket" (fried clams, oysters, cod, fries, onion rings & malt vinegar aioli); ceviche with ponzu, radish and avocado; fried oyster po' boy with coleslaw and house-made ranch; and a sirloin burger with cave-aged cheddar, bacon, and onion jam. So whether you're in the mood for seafood or are hankering for something from dry land, Izzy's is a great option. Sometimes you want to taste a bit of the high life, but you don't want to go broke doing it. Fortunately for you, The Forge Restaurant & Wine Bar is a perfect place to sample the finer things in life. The kitchen is run by Chef Christopher Lee, and the legendary wine bar is the product of sommelier Shareef Malnik's dedication to his craft. Happy hour offerings include mini salmon tartare tacos with avocado, pineapple and kimchi; Jamaican jerk bacon with tropical salsa; French onion soup with beef carpaccio, raclette and bone marrow crouton; and fried chicken dumplings with maple-scallion dipping sauce. But the big draw at The Forge is the Friday night champagne special: $50 bottles of Veuve Cliquot. So the next time you want to cap a long week with a little bit of bubbly, make sure you head to The Forge. Last (but certainly not least) on our list is Vagabond Kitchen & Bar. 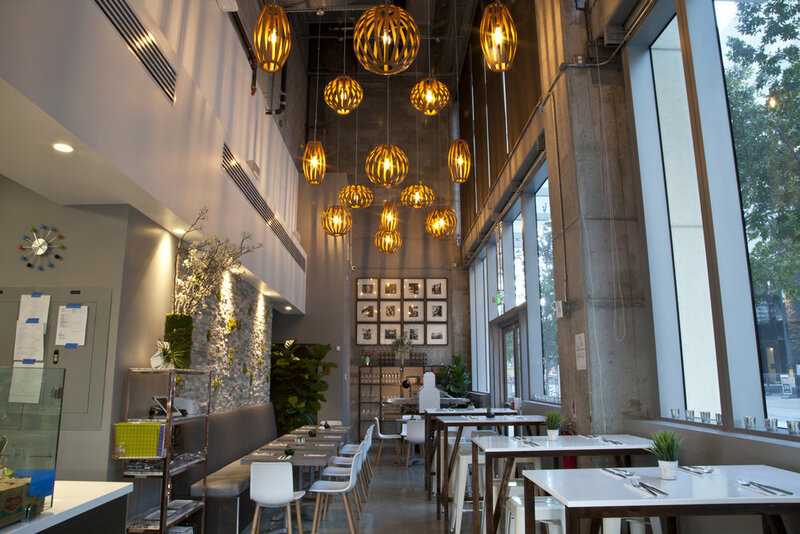 Situated in the Vagabond Hotel in the Miami Modern district, the menu offerings here cater to the "modern-day adventurer with a penchant for global food, drink, and art." It's a chic and quirky place, perfect for a relaxing evening after a long day. The happy hour menu offerings include tuna poke toast with avocado and sesame; mini wagyu burgers with sweet pickles and cheddar; stracciatella with herb oil, basil and toasted bread; and croque monsieur with honey glazed ham, truffle gouda, and béchamel. And to wash it all down, Vagabond offers $5 beer, $7 wine and well drinks, and $8 selected cocktails. Suffice to say, there are plenty of options for you to enjoy great food and drinks in an offbeat atmosphere. Make no mistake: happy hour is no longer just for the sports-bar set. Upscale restaurants are taking notice of all the potential customers who want to visit but haven't yet found the time to do so, and they're hard at work trying to bring those customers in. And when the rest of the Miami culinary scene follows the lead of these four restaurants, we have a feeling the days of happy hour consisting of soggy mozzarella sticks and cheap glasses of wine are numbered.